The android job portal app project is indeed to venture business which has a more future scope! 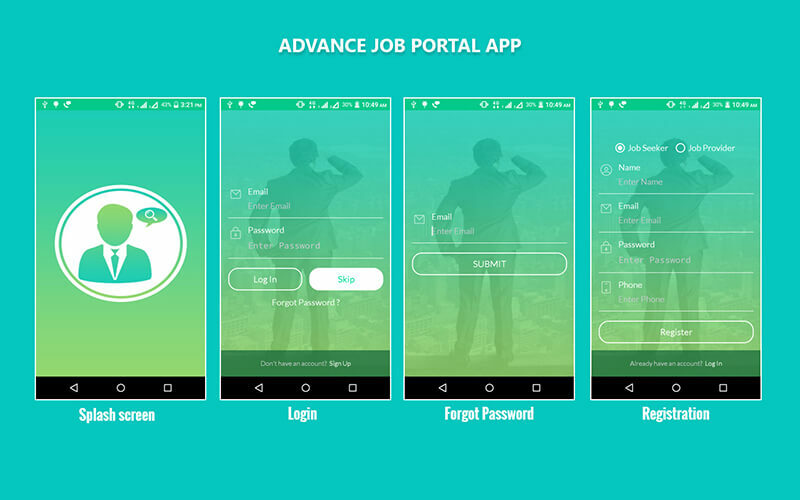 As simplified recruitment process which makes way convenience for job seekers to access job portal on the go, as our app script is built to supportnumerous business models as per the industry requirements. In this decade people are using their smartphone rather than web portals for job seeking online. So it is the right stintto launching career portal which balancesthe gap between recruitment board and job searcher candidates. Employee recruitment boardis clear to handle the career portal app and users resourcefully, an employment agency can post new jobs under the desired category. Job layout consists of job name, description, email id, phone number, address, job skill, salary, designation, company name, website, etc. In the job, list sectionshows a number of jobs currently available and one can delete the job which is outdated. Whereas, in applied user list shows a number of users who applied for a job can be listed. Job board or consultancy can make a phone call or send email to the candidates. Android job portal application is ready for sale, on purchasing our recruitment board app you will get the full source code and SQL database. Full-fledged career portal, an easy way to post the job and job seekers can apply for the job. Responsive design makes easy navigation around the application. We feel immense pleasure to help you around and thanks for watching our job portal android application, if you were interested in purchasing Android APK click add to cart. So kindly post your queries if any, our team expert will get back to you with your queries. Got an enhanced job portal for android within the investment worthy project again that best technology proven from you guys. Ultimate app provides solution to clients like us from you peoples looks great and useful when need of support regarding queries.